We work in partnership with Property Managers to supply energy & help them become more energy efficient. If you are in Property management, we offer a unique Energy Management Portal. The energy management portal provides remote management, letting you see the remaining credit balance for all units each and every day. With this tool, managing vacant periods is made simple. Pinergy ensure that when a property is vacant you won't have to pay the standing charge out of your own pocket. We allocate funds per property per year to eliminate these costs for you, our customer. If the tenant hasn't topped up their meter they won't have power - its as simple as that! As opposed to a bill pay service, it is impossible to go into a state of arrears with Pinergy. This means that you, the landlord or property manager, will never be left with an outstanding balance to pay once the tenants have moved on. 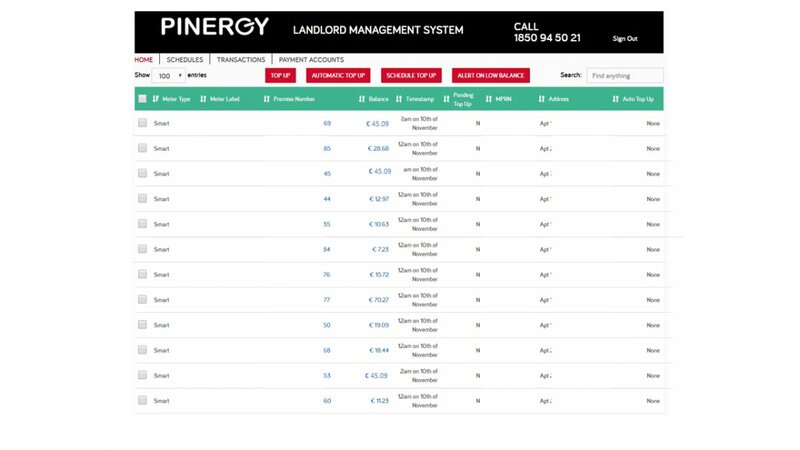 We understand that you might be managing more than one unit and, for this reason, we have developed our utility management portal so that you can view all of your properties in the same place, at the same time. This list can be used as your “electricity bible” or glossary of accounts and is only visible to the person responsible for the properties. Contact our professional advisors for tailor-made energy solutions for your business. As one of Irelands largest private landlords, Comer Group Ireland are extremely satisfied with Pinergy’s efficient service. The way Pinergy conduct business really suits our needs as our dedicated account manager is always on hand to provide updates or create new utility accounts at a moment’s notice. As a private landlord with 100 apartments I’ve saved so much time, money and hassle since switching my properties to Pinergy. With their online portal I now have full access to all apartments online and they have even created a pool of free electricity which covers all of my units during void periods. We were introduced to Pinergy via IPAV and we have since transferred several accounts to their Pinergy Smart system. All of these transfers have proceeded efficiently and without fuss and our customers are very happy. On a personal note, we have found Pinergy to be very friendly, efficient and professional. We are certainly happy with this arrangement and will continue using and recommending the company. In the busy world of Lettings, the Pinergy Smart system and online portal can alleviate a lot of the hassle and the niggly, time consuming jobs like meter readings or opening and changing accounts. Not only is it saving us time but for each property we convert to Pinergy we get commission which is deducted from our office electricity bill. I have been so impressed with Pinergy and their customer care that I have switched suppliers in my own home to Pinergy too. With over 400 student apartments we used to spend weeks trying to reconcile end of year balances. Since our first meeting with Pinergy and subsequent install of Smart Meters I can honestly say this was one of our best moves to date. We have seen huge savings in Energy usage and reduction in office Man hours with, thankfully, no more spreadsheets. The backup service is second to none with any queries dealt with immediately. At Gateway Apartments Sligo we have had Pinergy installed in our complex of 110 apartments for the past 3 years. Their online portal is second to none, it’s reliable, accurate and extremely efficient. It has everything you need at the touch of a button and there are no bills to worry about. I would highly recommend the Pinergy smart system to anyone. Pinergy are highly focused on energy savings and are innovative in this approach. KPM have been working with Pinergy to reduce annual energy costs dramatically for our clients. We are very satisfied with their service and focus on the customer, our clients. We have recently changed our properties over to Pinergy and the switch has been brilliant. The smart meter and utility management portal has made life so much easier for both us and the tenants. They have also cut out the calls to the service providers and having to wait on hold for an age. Pinergy have been a revelation since we starting dealing with them. The utility management portal enables us to manage our student portfolio electricity accounts in a much more transparent and easier to use manner. We also have our own dedicated account manager who is always readily available to troubleshoot any problems we may have. We would highly recommend Pinergy to anyone. We have been using Pinergy Smart systems in our rental portfolio for 2 years now and the amount of administrative headache associated with moving tenants in and out has been made a lot easier thanks to the solutions Pinergy have created for us. For us, the decision to engage Pinergy was based on the ease of use, freedom and extra layer of security the system affords both ourselves and our tenants.